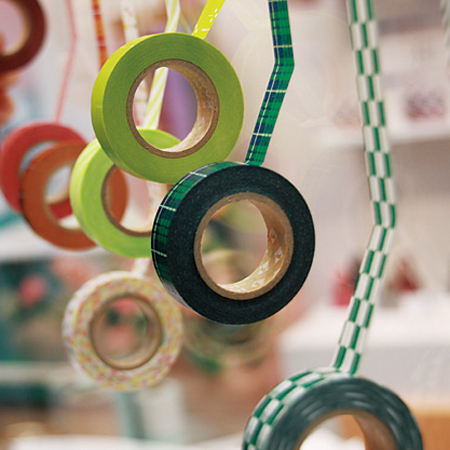 Colorful mt-masking tape has totally changed industrial masking tape which is used often in 3K (hard labor, dirty, strict) scene and it is an idea product which attract girl's heart and fill the demands of rapping and collage. Rapping is now a trend among young girls and there are various colors and patterns on colorful paper. It is noticeable by looking carefully that it is actually an industrial product used in construction and painting site. Its is made out of Japanese paper. From a large colorful variation which attract women to buy while using transparent but yet tough characteristics of Japanese paper and from the idea on package design of the tape one can see how strongly even the way of selling is considered. This idea shows was not simply came up. There was a serious development towards traditional material and the colorful tape of the rapping shows it is now going to be a temporal trend. Even for men it is an interesting product.